‘Dino Discoveries’ will see a brand new family show run from Saturday 10 February through to Sunday 29 April, revealing the creatures that roamed the earth, soared through the skies and swam through the oceans during the Mesozoic period. But are all these ancient creatures dinosaurs? 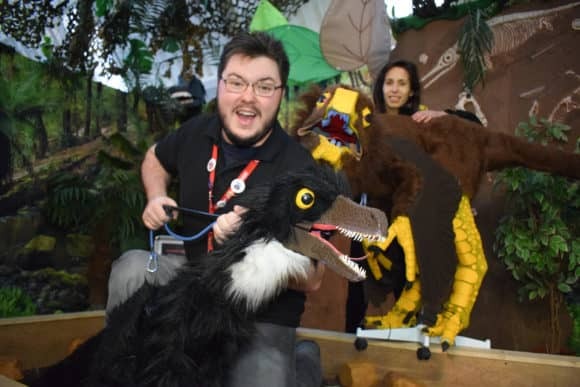 During the show, audiences will also get the opportunity to interact with Dundee Science Centre’s resident pre-historic pets, a group of amazing life-sized puppets which will bring some of the most important facts and theories about dinosaurs to life, as well as the other creatures that lived amongst them. Meanwhile, to keep the younger palaeontologists entertained, ‘Dig up a Dinosaur’ activities will also kick off on the same date, with the final event on Monday 19 February. Aimed at children aged three to five, this workshop will give youngsters the chance to unearth some dinosaur bones and identify what’s buried in the sand. Visitors will use tools-of-the-trade like brushes and shovels to uncover preserved treasures from millions of years ago. Find out what a fossil is, how they are formed and how to identify what they might have come from – as well as what fossils can actually tell us about creatures from prehistoric times.